Google takes a step forward to support the “Do Not Track” feature in its own browser. After the feature was included in the latest build of Chromium, which is the open source version of Chrome, it has finally arrived with the latest update of the Chrome browser. “Do Not Track” lets users to optionally send a request to their browsing network, stating that they do not wish to be tracked. The request is sent in the headers along with the actual request for a particular resource. Trackers (which mainly include ad networks and analytics), on receiving such a request, may then stop tracking that particular user. Being a company based largely on the revenue generated by targeted advertising, Google’s decision of including the feature to its own product was tough. Other web browsers, including Mozilla Firefox, Apple Safari and even Microsoft Internet Explorer already have the “Do Not Track” Feature available. At last, Google might have finally agreed to have the feature added rather than having to lose the users concerned more about their own piracy. See whether your browser is sending Do Not Track requests or not. Click on the Firefox button and go to Options. Under the “Tracking” section, check the “Tell web sites I do not want to be tracked” option. Click on the Safari menu and open Preferences. 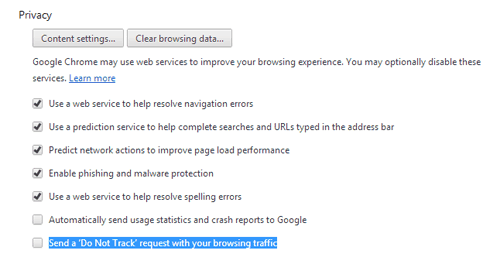 Under Website Tracking, check the “Ask websites not to track me” option. Go to this page and locate the “Click here to add an empty Tracking Protection list” link. A Pop Up will appear after some time. Click on the “Add List” button. Click the Spanner icon and go to Settings. Click on Show Advanced Settings towards the bottom. Under Privacy, check the “Send a ‘Do Not Track’ request with your browsing traffic“. There are a lot of posts on the Internet saying that “Do Not Track will kill the free Internet”. However, Do Not Track is not a Track-Blocker. Except for Internet Explorer (which blacklists advertisement networks based on some Tracking Protection List, Do Not Track is simply a request to the network. The network may not adhere to the request and track user data if it wants to. Chromium, Firefox and Safari have the feature turned off by default, though IE10 is supposed to have its feature on by default. So (except for those too-much-privacy-concerned people), people won’t be bothered about data tracking. Some will deliberately disable the feature, while some probably won’t even be aware of it. According to a survey, only 15% of the revenue comes from targeted advertising. It seems Do Not Track won’t hamper advertising to that extent. It might not be the free-Internet-killer after all.